On the 11th of February, 15 speechies from all over East Hume participated in a presentation about the iPad and its use for communication by Katie Lyon, from the Communication Resource Centre. The tricky bit….the meeting was in Wangaratta and Katie was in Melbourne! 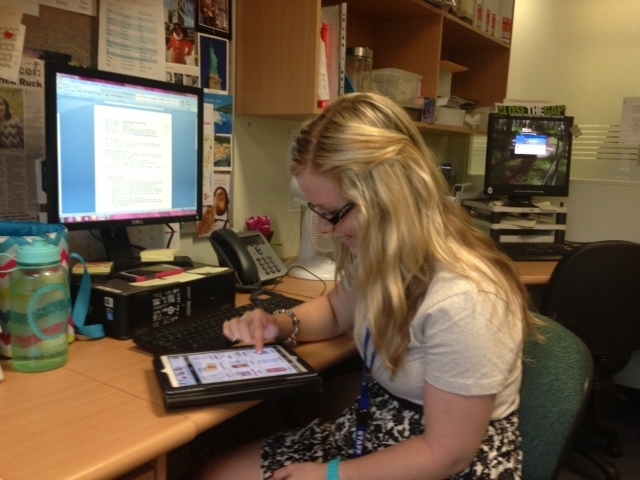 4th year speech pathology student Jayemin Barry has fun testing out some of the handy accessibility features demonstrated by Katie whilst preparing for a client session. With new technologies on the rise as well as continuing pressure for rural Speech Pathologists to find alternative methods of service delivery and ways to increase their knowledge, we decided to put our words into action and trial an online meeting using the freely available “Google Hangout” technology. Google Hangouts are a way of conducting online voice or video conversations with up to 10 people. You can also easily share the content on your computer and YouTube videos using the screen share option. The best part is that it is free – no accounts or subscriptions needed, just a Gmail account and an internet connection. It is fairly intuitive to use at a basic level and from our experience, quite reliable. No wonder this is fast becoming a popular way to meet online with colleagues and provide training in a more accessible way. The Google Hangout was wonderful. Not only could we see Katie on screen, but she was also able to reflect what was on her iPad and reflect her screen to show participants, meaning that as Katie was describing tools and giving practical instructions, the audience was right there with her, able to see exactly what she was doing. The video and audio was clear and feedback from the group was positive. Katie’s presentation focused on the use of the iPad in Speech Pathology practice, the benefits and limitations of using the iPad, the importance of choosing the best apps for each individual client using a feature matching approach and briefly showed some of the latest and greatest apps that are currently available. Katie also explored various accessibility settings such as assistive touch, suitable for those with a physical disability and speak selection, a useful tool for anyone with literacy difficulties. The group of 15 Speech Pathologists varied greatly in their expertise and clinical practice areas, but all agreed that the presentation was informative and relevant. They were also very impressed with the use of the delivery method vis Google Hangout, and felt confident and empowered to trial this technology to deliver services to clients in remote locations or share knowledge with their peers. For more information about Google Hangouts and its use for training and education please see this article or just Google it – there are heaps of support materials out there to get you started. This entry was posted in Uncategorized on February 28, 2014 by crcscope. Communication Access is about communicating with people who do not use speech or have speech that is difficult to understand. The most important thing is for all of us to be aware that communication is a two-way process. Both people need to take some responsibility for making the communication effective and successful. To find out more about Communication Access read the: Communication Access for All booklet (PDF 4.7 MB). Some of the places in Victoria that have been assessed as being Communication Accessible include Bendigo Bank, Lara; Frankston Visitor Information Centre; Peninsula Cinemas in Warragul; Warrnambool City Council, Civic Centre. If you want to find out more about becoming communication accessible (in Victoria) please contact us by Email: [email protected]. This entry was posted in Uncategorized on February 10, 2014 by crcscope.